The MBPC is dedicated to making complex information easy to understand. Our team strives to provide our work in variety of formats including videos and animation to breakdown down the data, explain the policies, and show the impact on the lives of Montanans. In 2017, the Montana Legislature enacted deep cuts to health and human services, which resulted in the closure of more than half of the state’s outreach offices that serve rural Montanans. This video shares the O’Neill family’s personal story about how the office closure in rural Montana hit their family in unexpected ways, affecting their ability to put food on the table and get health care coverage. Between the regular legislative session and the special session in 2017, Montana legislators cut more than $30 million from provider rates and services that are essential for children and adults with developmental disabilities. These cuts meant that families now have fewer community-based supports. This video shares the Janssen family’s personal story about how the cuts to disability services has made it harder for Montanans like Jake to maintain independence, receive quality care, and remain free of institutions. Montana has a special tax break for capital gains. This allows an investor who sells stocks to pay a lower tax rate than a firefighter who earns wages. Montana can continue to give a special deal to wealthy investors or we can collect the revenue we need and investing in our communities. In Montana, those who are working minimum wage jobs pay a higher share of their income in taxes, while those wealthiest tax payers get a special deal. Over the past decade, this special deal has cost our state nearly $1 billion. It is time for Montana to get back on track by restoring the top tax bracket on incomes over $1 million. This much-needed revenue will help update our schools, fix our crumbling infrastructure, and build a brighter future for our state. How does the Earned Income Tax Credit Work? The Earned Income Tax Credit (EITC) is a tax break for working people with low incomes, which adds to their overall income and helps them make ends meet. This short video explains how it works. MBPC – Who Are We? 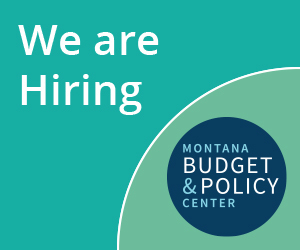 The Montana Budget and Policy Center is an organization working to improve the lives of families in Montana. We produce research and analysis on tax, budget, and economic policies with the goal of finding workable solutions for Montana. We know what you are thinking. What does that mean? Check out this video to learn more about who we are and what we do. Right now, Montana communities are hurting because instead of collecting the money we need and investing in our communities, special interests have gotten away with massive tax breaks. To keep Montana the state we love we need new revenue. It is a simple choice. Learn more about how we can get our state back on track. In 2017, Montana enacted a state earned income tax credit which will help 80,000 working Montana families make ends meet. Learn more about why this is an important step forward for so many in our state. In 2015, Montana expanded Medicaid to cover tens of thousands of Montanans left in the coverage gap without access to affordable health care. Hear Michele’s story and why continuing this program is so important.